If you could take the test today, would you? I know I would. I’ve putting myself through hell since January, and any additional studying would marginally improve my score at best. At this point, I’m just trying to memorize the tiny nuances and retain everything. It’s possible that for every new thing I learn, I forget something else. Between Schweser and CFAI, I have taken 6 mocks, and scores have ranged from 78-88%. I know that doesn’t guarantee I will pass by any means, but I don’t think studying an extra 40 hours will improve those scores any. The other night, I decided to take a night off from studying. I cam back from work, played video games for 2 hours, watched a movie, then played more video games. I can’t wait for June 6th. My review schedule was built upon multiple mocks/samples (I’ve completed 4 to date, still have 1 schweser and the full CFAi mock set for Saturday) and a continuous review of my notes/note cards the week of May 31st. I’m hoping that final week will bring it all together. I’m scoring in the 72-78% range on mocks/samples, so I think I’m in good shape, but am far from where I want to be. 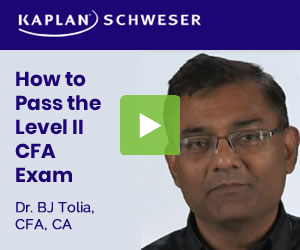 I’d like to score in the 78-82% range on the last Schweser and full CFAi mock. I think I’m ready to take this test by Sunday.. I’ll finish Equity tonite & finish my syllabus..Should be exam ready by sunday..
i would. Not gonna be significantly more i pick up in the coming days. Just want this done. I probably would take it this Saturday if I could. I don’t want to study this coming Monday =(. I’m not taking anytime off from work next week. I tried that last year and it was such a waste. Unless its something fairly specific and you know what that area is, there just isn’t much you can learn at that point IMO. I may try to hit up AA one last time as I cannot break the 50% score on this section. Personally, I wouldn’t. But then, I took a mock last night and got a 65%. I know that I can boost that by 5-10 percent if I can nail down a few really troublesome topics, maybe even more if I get next week off from work. I admire the folks who say they feel ready now - good on you, hope to hear that your confidence and good prepping show up when we’re all replying to the “Official CFA L2 June 2010 results” thread! If I could, I would. I can’t, so I won’t.